Kang Y, Lee DC, et al. (2007). 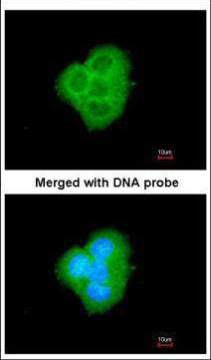 Biochem Biophys Res Commun. 359(1):76-82.Guillemin Y, Lalle P, et al. (2009). J Mol Med (Berl). 87(9):923-40. Figure 1. 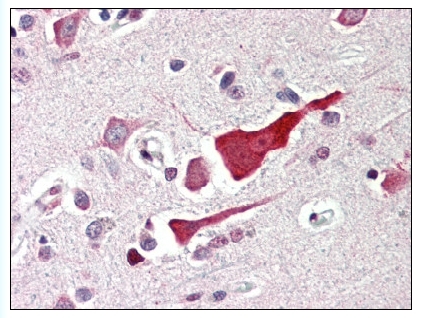 Formalin-Fixed Paraffin-Embedded (FFPE) on Brain, cortex. Western Blot analysis of BCL2L10 expression in transfected 293T cell line by BCL2L10 monoclonal antibody (M03), clone 1B11.Lane 1: BCL2L10 transfected lysate(23.2 KDa).Lane 2: Non-transfected lysate. 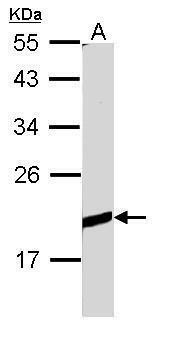 Western Blot analysis of BCL2L10 expression in transfected 293T cell line (H00010017-T01) by BCL2L10 MaxPab polyclonal antibody.Lane1:BCL2L10 transfected lysate(22.44 KDa).Lane2:Non-transfected lysate. 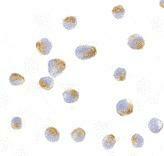 Immunocytochemistry of BCL2L10 in Jurkat cells with BCL2L10 polyclonal antibody ( Cat # PAB12902 ) at 10 µg/ml. Western blot analysis of BCL2L10 in Jurkat lysate with BCL2L10 polyclonal antibody ( Cat # PAB12902 ) at 1 µg/ml in the ( A ) absence and ( B ) presence of blocking peptide. Western Blot analysis of BCL2L10 expression in transfected 293T cell line (H00010017-T01) by BCL2L10 MaxPab polyclonal antibody.Lane 1: BCL2L10 transfected lysate(23.20 KDa).Lane 2: Non-transfected lysate. Western blot analysis of Bcl-B in Jurkat lysate with Bcl-B antibody at 1 ug/ml in the (A) absence and (B) presence of blocking peptide. Immunocytochemistry of Bcl-B in Jurkat cells with Bcl-B antibody at 10 ug/mL. Sample (30 ug of whole cell lysate). A: Raji. 12% SDS PAGE. TA308442 diluted at 1:1000. 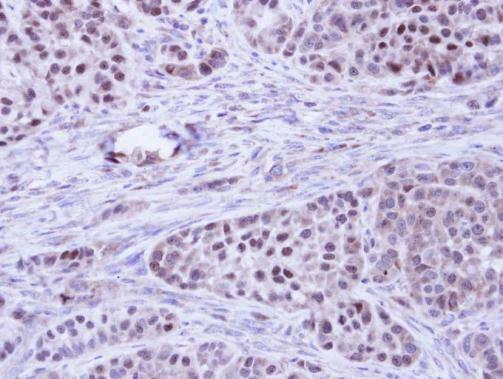 Immunohistochemical analysis of paraffin-embedded A549 Xenograft, using BCL2L10(TA308442) antibody at 1:100 dilution. Immunofluorescence analysis of paraformaldehyde-fixed A431, using BCL2L10(TA308442) antibody at 1:200 dilution.